The purpose of this case study was to illustrate the diagnostic efficacy of CBCT for accurate diagnosis of split corpus fracture in the mandible in a trauma case. A 33-year-old female patient had a trauma to her mandible due to a fall 2 days before her admission to our clinic. Her medical anamnesis was unremarkable. Clinical examination revealed that she had no pain and no problem with occlusion, whereas she had limited mouth opening (<40 mm). As well, she had a hematoma on the lingual side of left posterior mandible and luxation in premolar teeth. Following clinical examination, the patient was scanned with OPG (Planmeca Promax, Helsinki, Finland), which revealed no fracture in the left corpus area, but a fracture line on the right condyle [Figure 1]. Further imaging performed with CBCT scanner (Iluma, Imtec Corporation, Oberursel, Germany) showed that the fracture in the condyle region was a dislocated incomplete fracture. In addition, a second vertical dislocated incomplete split lingual cortex fracture line in the left mandibular corpus, extending lingually from the distolingual side of the third molar to the parasymphyseal region was observed [Figure 2]a-e. The fracture was fragmented in the molar region, whereas not fragmented in the parasymphyseal region [Figure 2]a. The patient was referred to the oral surgery clinic for intermaxillary fixation. Mandibular fractures are relatively easy to diagnose comparing to the other craniofacial fractures. Chayra et al. showed that 92% of the mandible fractures could be seen on OPG. Displacement of fracture segments commonly occurs in mandibular corpus fractures as a result of the differing forces of the muscles acting upon the mandible. In our case, there was no dislocation in the fracture fragments in mandibular corpus, which made it harder to visualize the fracture lines on OPG. As well, diagnostic accuracy of OPG will be poor when the fracture line is not parallel to the X-ray beam, especially in split fractures,  as seen in our case. Three-dimensional techniques have become increasingly important in diagnostic imaging, especially in trauma patients. Although CBCT costs more than conventional panoramic machines, it offers wider range of diagnostic options. Some CBCT scanners allow the height of the field of view to be adjusted to capture only the necessary region to be studied complying with the principles of radiation protection. However, in trauma patients, maxillofacial region should be evaluated as a whole, that targeting only on the fractures, which is visible or suspected clinically, may cause the fracture lines to be overlooked. 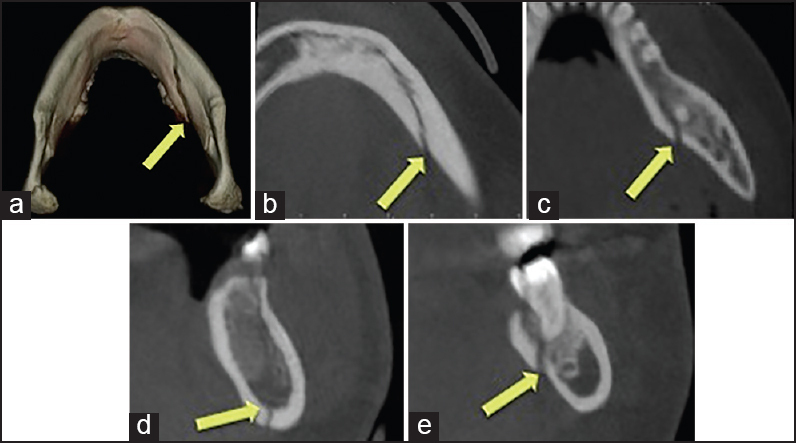 In this case study, it was shown that OPG was not able to detect split corpus fracture of the mandible, whereas it could be visualized on CBCT images gathered with a scanner that has a large field of view. In the literature, it was reported that 50% of mandibular fractures are seen doubly fractured. Parasymphyseal fractures are frequently associated with fractures at other sites of the mandible. In our case, there were two separate fracture lines, one in the condylar region, and the other in the mandibular corpus region on the opposite side. Accompanying limited mouth opening might be attributed to the trismus caused by condylar fracture and the dentist might not need further imaging. When evaluating the mandibular fractures, enough time should be taken to interpret the images in detail, in correlation with the examination findings, which is mostly not applicable in emergency departments. In our department, the dentomaxillofacial radiologists perform both clinical and radiographic examination of the patients, which leads to a better handling of the patient taking both the clinical and radiological findings into consideration. This report accentuates that OPGs may be misleading for accurate diagnosis of mandibular fractures. With regard to the mandibular split corpus fractures, we suggest that CBCT is crucial and should be mandatory for all suspected mandibular fractures along with OPG in maxillofacial trauma patients. Dell' Aversana Orabona G, Iaconetta G, Abbate V, Califano L. Bifocal mandibular fractures: Which should be treated first? J Craniofac Surg 2012;23:1723-7. Shintaku WH, Venturin JS, Azevedo B, Noujeim M. Applications of cone-beam computed tomography in fractures of the maxillofacial complex. Dent Traumatol 2009;25:358-66. Bornstein MM, Wölner-Hanssen AB, Sendi P, von Arx T. Comparison of intraoral radiography and limited cone beam computed tomography for the assessment of root-fractured permanent teeth. Dent Traumatol 2009;25:571-7. Roth FS, Kokoska MS, Awwad EE, Martin DS, Olson GT, Hollier LH, et al. The identification of mandible fractures by helical computed tomography and panorex tomography. J Craniofac Surg 2005;16:394-9. Barghan S, Tetradis S, Mallya S. Application of cone beam computed tomography for assessment of the temporomandibular joints. Aust Dent J 2012;57 Suppl 1:109-18. Nair MK, Nair UP. Imaging of mandibular trauma: ROC analysis. Acad Emerg Med 2001;8:689-95. Chayra GA, Meador LR, Laskin DM. 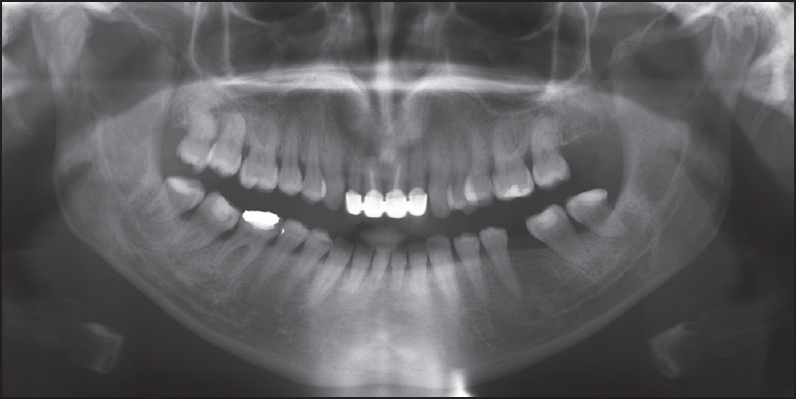 Comparison of panoramic and standard radiographs for the diagnosis of mandibular fractures. J Oral Maxillofac Surg 1986;44:677-9. Sever C, Kulahci Y, Uygur F, Karagoz H. Unusual split fracture of the mandible. J Craniofac Surg 2011;22:e10-1.